I am very excited to introduce the documentation panel, one of the newest features of PCSWMM. The purpose of this panel is to keep an ongoing inventory of all the files that are frequently used in the construction of a PCSWMM model. From my own experience I can say that the addition of the documentation panel has made my work flow much more efficient and organized, in fact my first steps in any new PCSWMM model is the creation of a documentation catalog. One huge advantage to having a documentation panel is to ease the stress of organizing and accessing files that are associated with a particular project. Large projects can have hundreds of files including site photos, CCTV video, Excel worksheets, GIS layers, as-built drawings, time series files, meeting notes, reports, and more. Another practical application for the documentation panel is to keep track of files that have been provided by a client. This ensures all provided files are accounted for and have been properly identified, tagged and time stamped with the date the file was received. The documentation panel works by saving the file paths of all project related files in a single documentation catalog, and can be used to easily find and access these files on both local and network drives. Files can be easily added by either dragging and dropping the file directly to the documentation panel or by manually adding a document using the Add Document button. Once added, files can be assigned key words or tags in order to further sort the project files by editing the document meta data (comments, tags, etc.). Tags can be either SWMM5 object tags (Subcatchments, Junctions, Raingages, etc.) or can be user-defined tags. An example of the versatility of the tag function is seen in the screen capture below of a map of raingage locations in a watershed. This map/document was assigned three tags, two PCSWMM project tags: Time series and Rain Gages and one user-defined tag: Maps. The user could then specify in the documentation panel to only view documents with the tag 'Maps' and from there be able to quickly locate and open the map document. Once the files are added they can be easily opened for viewing or editing by selecting the item. 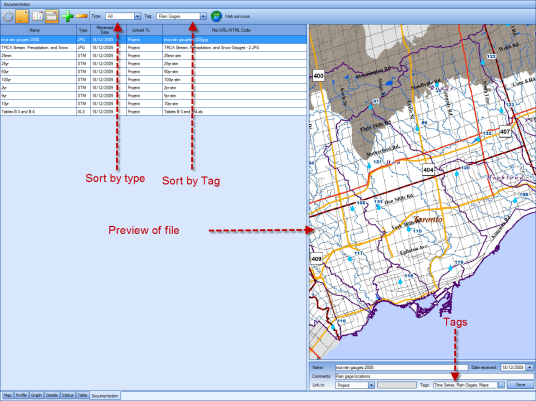 If the file is a GIS layer, the layer can be easily opened in the Map panel by selecting Open in Map from the documentation display window. In a similar way, time series files can be opened in the Graph panel. 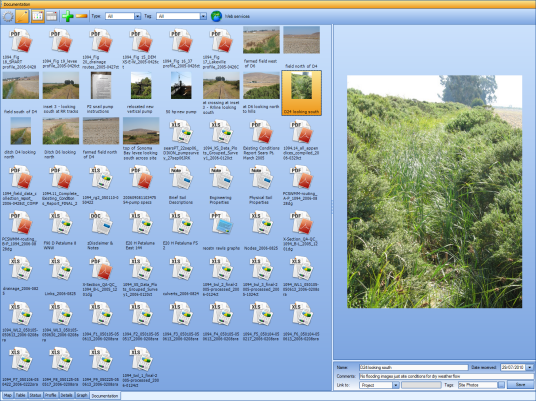 If the file is a photograph, PDF, or web resource, the file can be quickly viewed in the documentation display window (with mouse wheel zoom support). In my own experience of working with large hydraulic models, I have found that the associated model files can become mixed up between multiple users if the common drive is not updated or the newest version of the data file was re-named and not recognized by another user. File disorganization can be costly and time consuming if the problem is not initially caught. The documentation panel was created in part to prevent this common mix up between multiple users by making a single index of all related files accessible to anyone working with the project. The documentation panel can be easily set up to ensure that all working parties are able to access the most up-to-date files with a click of the mouse, by simply locating the documentation catalog on a common network drive, where it can be accessed by all related PCSWMM projects. For even more convenience, multiple projects can use the same documentation catalog, and all project documentation can be archived within a single compressed zip file for ease of transfer to clients or backup.